SUMMARY: Inspired by Californian’s brilliant sunshine, the architecture of the client’s home and the beautiful vistas of the surrounding hills, we created a sustainable landscape design that integrates drought resistant plants and employs permeable pavement, recycled materials,and Mediterranean style elements such as urns, fountains and sculptures. 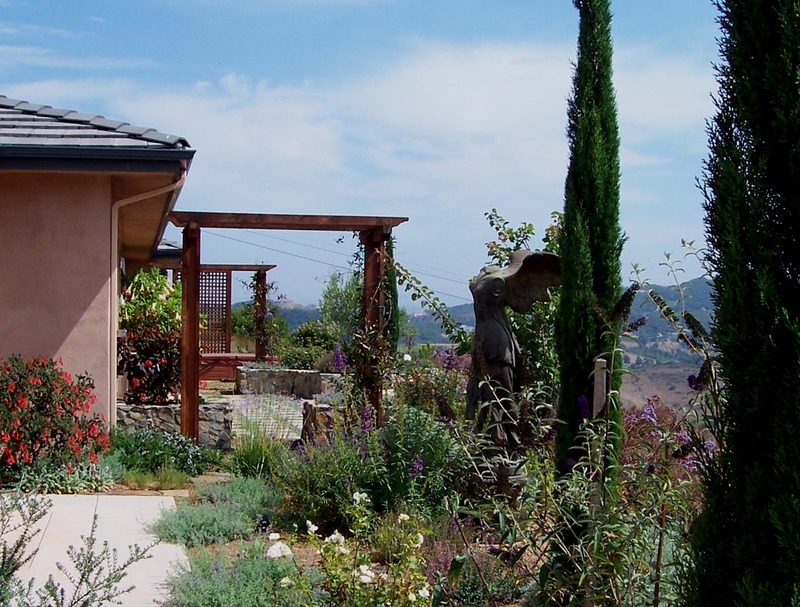 The homeowners needed landscape design help organizing the outside space into several distinctly different, comfortable spaces that would honor the magnificent view and maximize outdoor living as much as possible in Southern California’s mild climate. 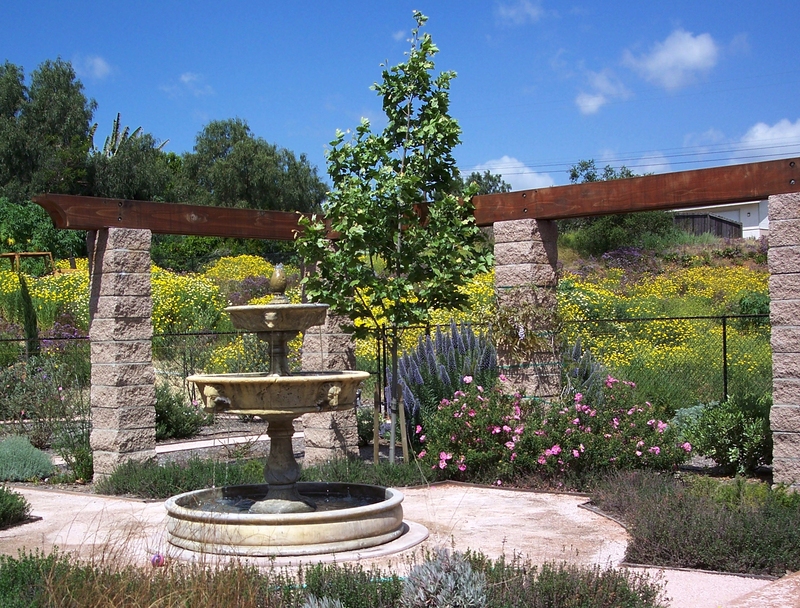 The home landscape design should honor principles of sustainability with the recycling of existing material and the addition of a low water landscape that would demand only a minimum of maintenance.Lastly, it needed to have a distinctly Mediterranean flair to complement the home’ architecture, the statuary and fountains that the homeowner planned to incorporate. With so much space to work with and the beauty of the rugged landscape and mountains surrounding the home, I had a lot of inspiration. We opted to keep the existing pavement at the backside of the house rather than breaking it out. 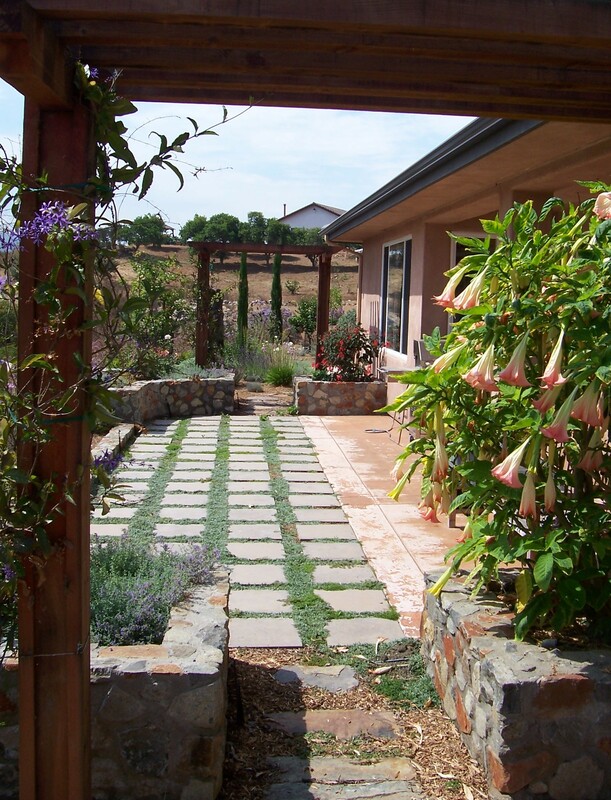 Instead we increased the outdoor entertainment space by adding prefabricated stepping stones that would have low maintenance needs and also allow more water to enter into the subsoil. 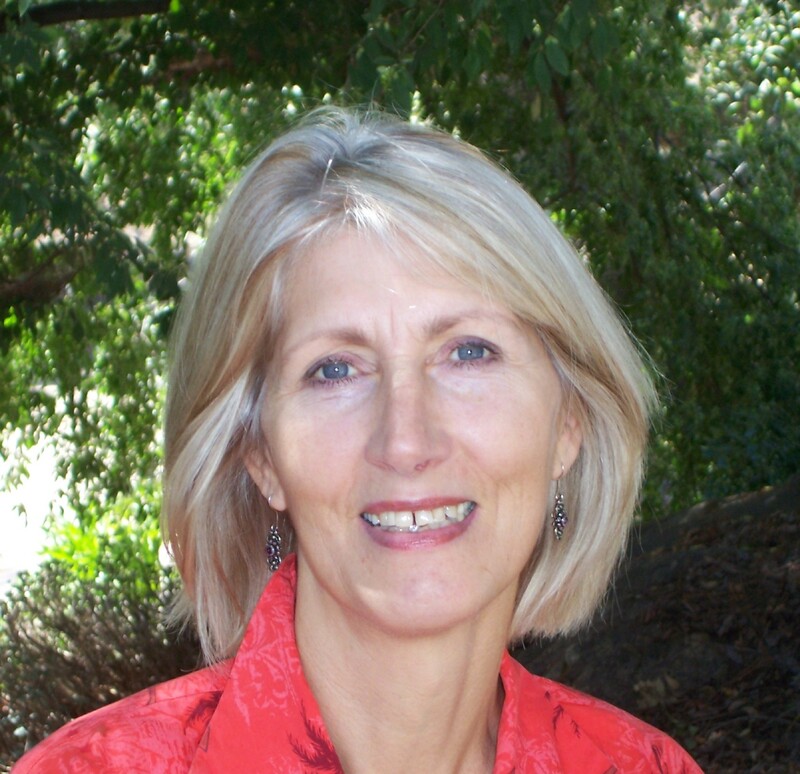 Between the stepping stones I planted the xeriscape plant Silver Carpet Dymondia margaretae. It is a tough, low-growing plant with very low water needs that will soften the edges and can tolerate light foot traffic. 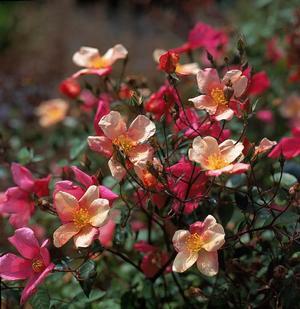 The exceptionally healthy and vigorous China rose ‘Mutabilis’ was added because of its charm and its tolerance to a low-water regime. 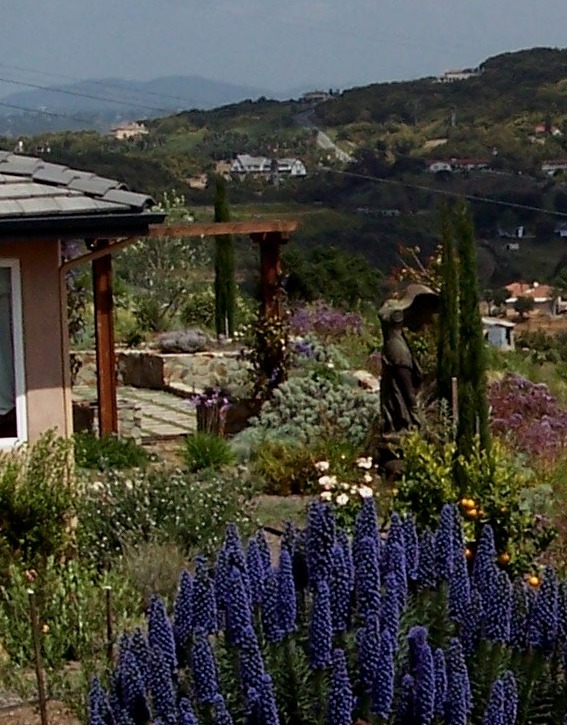 On the slopes, we planted California natives such as Mountain Lilac Ceanothus, Manzanita Arctostaphylos, Rockrose Cistus, Coyote Mint and California Sunflower that would tolerate (and stabilize) the rocky soil and appreciate the fast drainage. When selecting these plants, I paid careful attention to their spacing as well as their fire resistance, as this is an area where wild fires are a part of the ecosystem. While the plants are growing in, arbors and raised planters provide additional seating as well as “backbone” and structure.Using the local field stone for these makes a lot of “sustainable sense” and gives this home a strong sense of place. Separate garden “rooms” were created for different uses: One large extension of the living room for the enjoyment of the view and outside entertaining, and a more private area for relaxing in the spa. 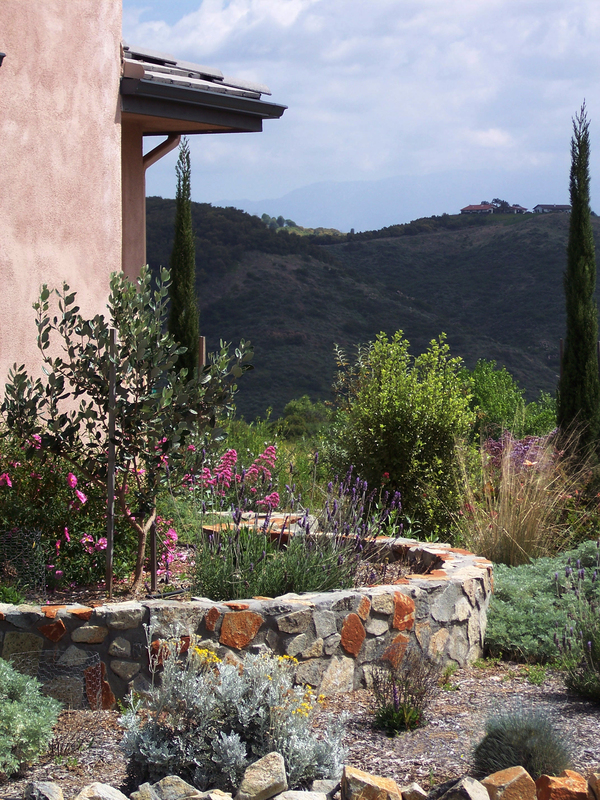 The arbors were planted in raised beds and serve as partitions while preserving the 180 degree view.Many iconic Mediterranean plants in this xeriscape landscaping accentuate the Mediterranean feeling of this garden. 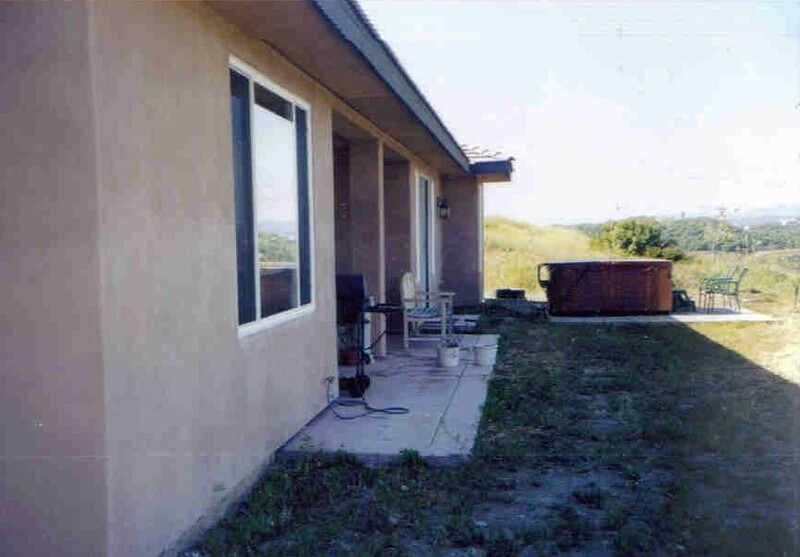 Making this courtyard private and enclosed while not shutting out the view of the surrounding hills seemed a challenge. The answer was an enclosure created by a wrap-around arbor- trellis that stood in for the “walls” and “ceilings”, while the open space between shrubs and beams provided generous “window” openings that allowed the view outside. 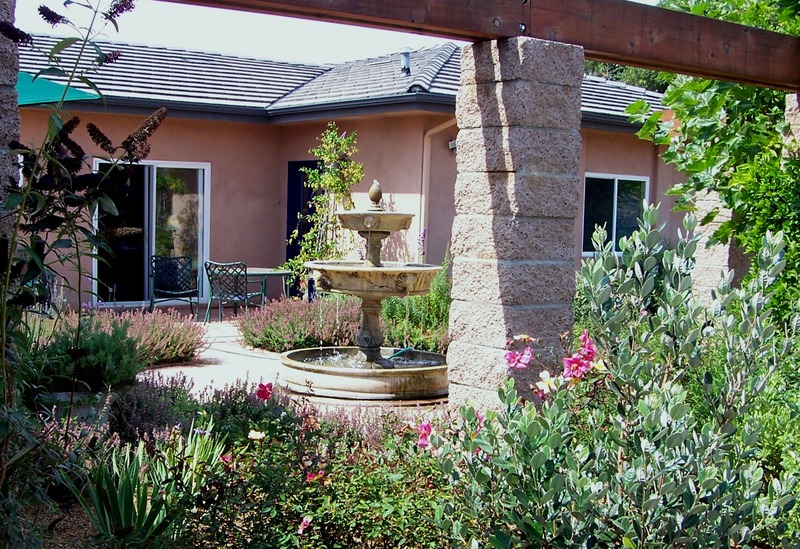 Thus the fountain courtyard became the intimate and contemplative space the homeowner had dreamed of.